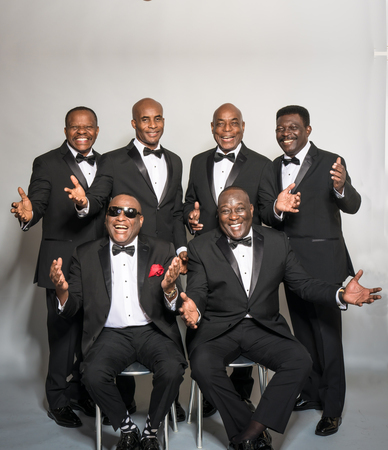 Tabou Combo, the living legends of the Haitian compas genre which originated in 1968 in Pétionville, a district in the capital city of Port-au-Prince. This year the group celebrates its 50th birthday. The band has all it's original members; Kapi on percussion, Herman Nau on drums, Jean-Claud-Jan on guitar and singers Shoubou and Fanfan. Reynald Valme on congas and Ralph Condé - the best guitarist of Haitian compas - are also original members of the band. Tabou Combo has an impressive discography. Their oldest work, from the '70's, shows a pure, mesmerizing sound with a central guitar, drums and accordion. The singles 'A La Canne a Sucre', '8th Sacrament' and 'Respect' are milestones from their early career. In 1974 they scored a number one hit in France with the immortal 'New York City'. This is the city where the group then moves to, to then take their music internationally. After that we hear a sound from them with more funk. The five-part album series 'Anthology' collates all Tabou-music from the peak of their career. In the '90's the group stayed at the top with hits like 'Zap Zap' and 'Aux Antilles' which are somewhat the musical peak of Haiti creativity, maybe and even the whole Caribbean! Tabou's last studio-album is 'Conpas to the world' from 2011. They celebrate their 50th birthday for its Parisian fans in the 7000 capacity temple Zénith. The band has stood on our stage before: the first time was in '93, afterwards in the legendary sold out year '97 which was also with Oscar d'Leon and Alfredo Gutierrez, and the last time was '98 during the first edition of Antilliaanse Feesten Indoor in the Antwerp Sportspaleis. We welcome this legendary band back with than a warm heart. Tabou Combo is coming exclusively to Hoogstraten by invitation.